Emily Ferguson, a third-year player on the women’s lacrosse team, was named the 2018 Outstanding Women of Laurier award recipient for exemplifying excellence in academics, in the community and on the playing field. Ferguson was one of three nominees for this year’s award, presented in the spring during the 13th annual Outstanding Women of Laurier dinner. Other nominees included cross country runner Jessa Braun and women’s curler Bridget Ribau. A third-year kinesiology and physical education major, Ferguson is the first women’s lacrosse player to win the award. "Being nominated in of itself was fantastic and being named to the roster of the Outstanding Women of Laurier is amazing," Ferguson said upon receiving the award. "I'm still kind of in shock." 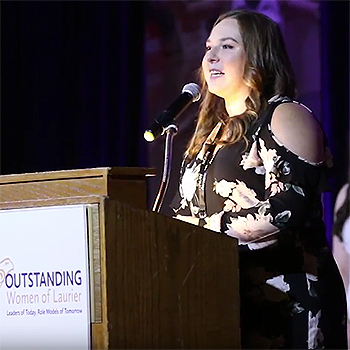 Video: Emily Ferguson honoured at 13th annual Outstanding Women of Laurier dinner. Laurier launched the Outstanding Women of Laurier award in 2006 to recognize female students who combine athletic and academic achievement with a commitment to the community through volunteerism. "Being named to the roster of the Outstanding Women of Laurier is amazing." Ferguson, who is from Waterloo, has been a key member of Laurier's women’s lacrosse team since 2015 and served as captain during the past season. During her first year with the team, she was named lacrosse rookie of the year and an OUA Academic Achievement Award recipient. She has built on that success each year since, capping the 2017 season by being named an OUA First Team All-Star. Off the field, Ferguson has dedicated her time as a coach in both field lacrosse and ringette. She has also taken on the task of mentoring her peers at Laurier, serving as an Athlete Academic Coach in the Athlete Academic Success Program and serving as a peer tutor with the Accessible Learning Centre. This year’s Outstanding Women of Laurier event raised close to $30,000 to support women’s athletic initiatives, scholarships and mentoring programs at Laurier.